2,000 panels producing 520,000 kwh/year and reducing the energy bill to almost zero. 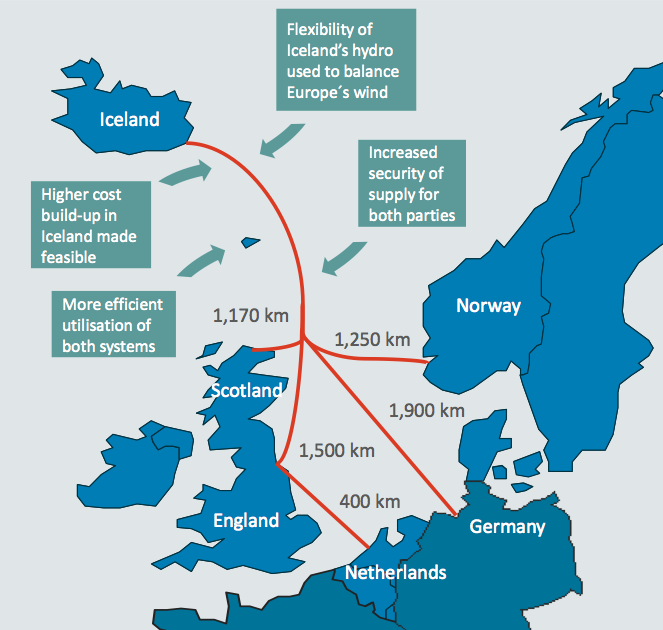 An essential part of the solution to Europe’s energy problems is the European Supergrid. It means that all European countries will be interconnected to even out demand and supply patterns. Most countries in continental Europe are already strongly interconnected. A missing link though are connections to the country that could serve as ‘Europe’s battery pack‘: Norway. 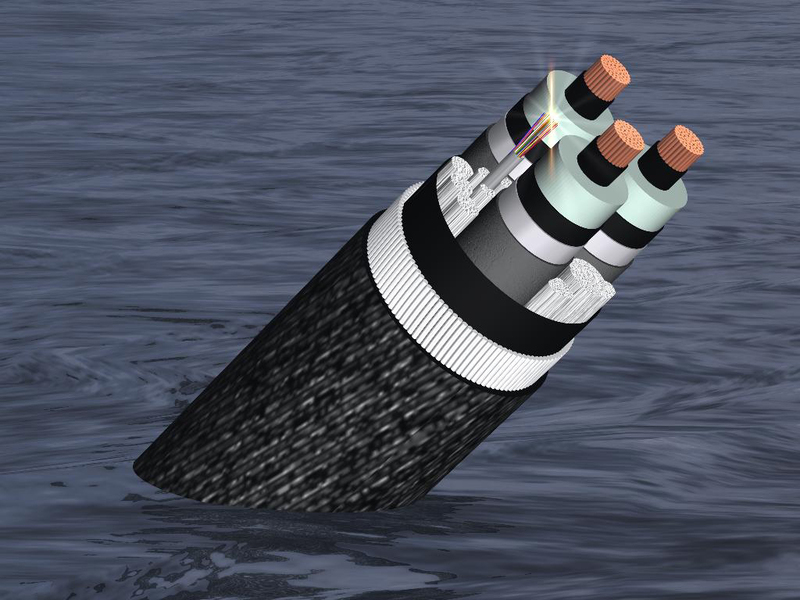 The first subsea connection was between Norway and The Netherlands: NorNed. Others followed like BritNed. 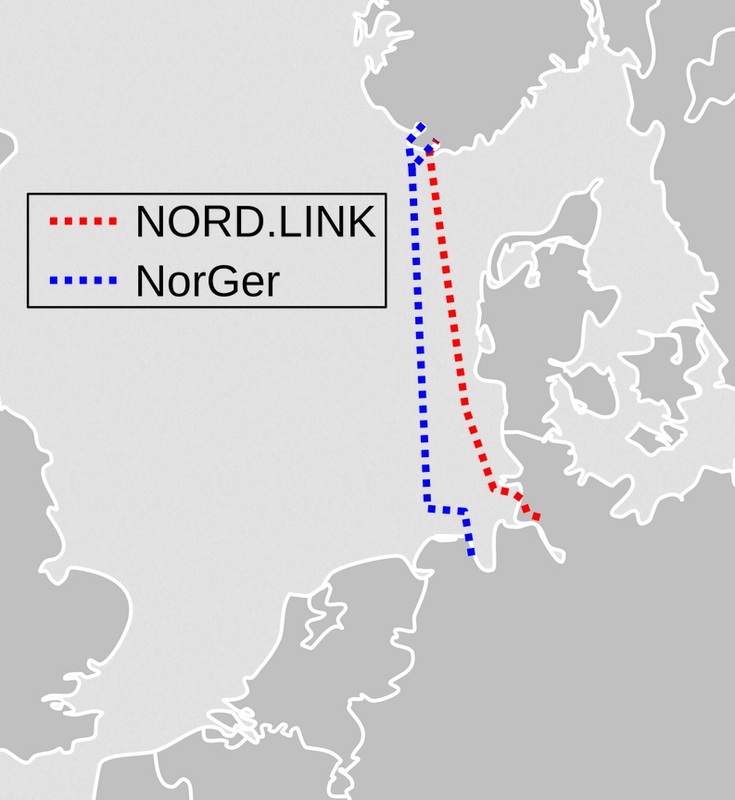 The Germans also have plans to link Germany with Norway: NorGer and NORD.LINK. NorGer plans got concrete by December 2012. 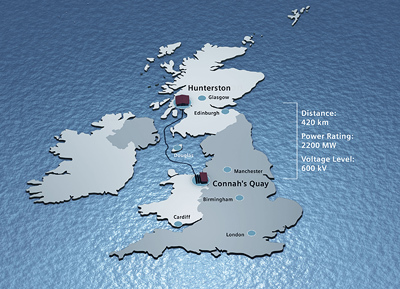 Siemens has won a 1.1 billion euro contract to connect England and Scotland (420 km, 2200 megawatts bi-directional, late 2015). SSE’S Norway Interconnector Project. Meanwhile, SSE has withdrawn from the project. NorthConnect‘s other partners, Sweden’s Vattenfall and Norwegian companies E-CO Energi, Agder Energi and Lyse, said it would not affect their plans. NorthConnect has the support of Alex Salmond, the First Minister of Scotland, the man pushing for Scottish independence. [bloomberg.com] – NorthConnect Won’t Cancel Plan for U.K.-Norway Electricity Cable. 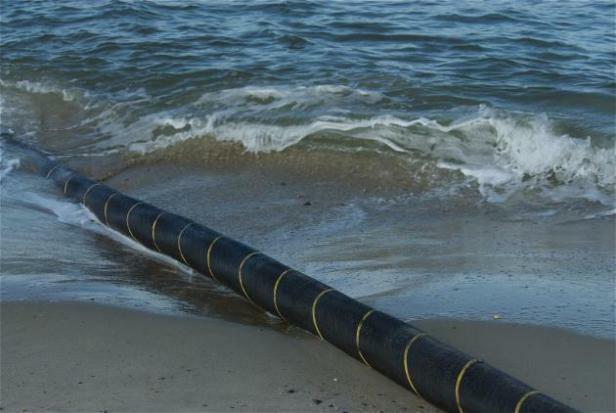 [theglobeandmail.com] – Iceland revives plans for world’s longest subsea power cable, Jan 9, 2013. Now even Israel wants to get connected to Europe (Greece), to start with Cyprus. Is Europe on Renewable Energy Target? With seven more years to go to 2020, how far are individual EU countries away from implementing the ageed upon renewable energy targets for 2020? The usual suspects Sweden and Germany are doing fine. Denmark is not even listed, but is doing fine, no surprises here. Positive suprises from Spain, Italy and Portugal, disapointing results from the Netherlands and UK so far, but it needs to be mentioned that both countries recently announced ambitious plans to catch up on time [Netherlands, UK]. [ec.europa.eu] – Renewable energy Targets by 2020. In the European Union, Member States are subject to Directive 2009/28/EC on renewable energy, implemented by Member States by December 2010 which sets ambitious targets for all Member States, such that the EU will reach a 20% share of energy from renewable sources by 2020. This is the largest wind farm in Kansas. 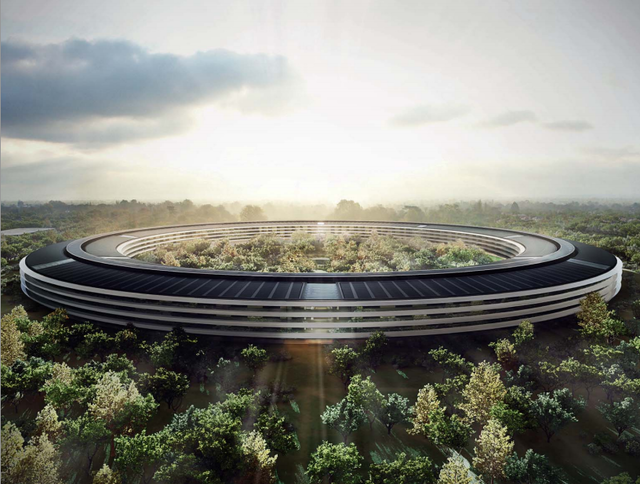 Cost: $800 million. Name: Flat Ridge 2. Location: south-central Kansas/USA. Infrastructure: 294 GE 1.6 MW turbines on a 66,000 acre site. 500 jobs during peak construction, 30 permanent maintenance jobs. California state and US federal authorities are beginning to prepare for creating conditions that would allow for rapid introduction of large scale renewable energy (solar, wind and geothermal) in an area of hundreds of square miles in the desert of Southern California (Desert Renewable Energy Conservation Plan or DRECP). The plan would cover portions of eastern San Diego County and stretch across much of Imperial, Inyo, Kern, Los Angeles, Riverside and San Bernardino counties. It’s an area roughly the size of Indiana or Maine. 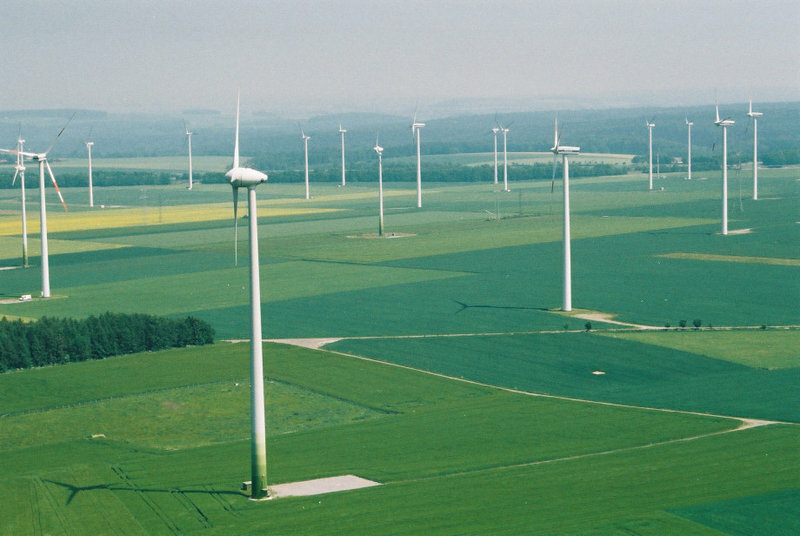 Wilpoldsried is a perfect example of how energy problems should be tackled. We are no fans of Karl Marx here and we would have preferred if he had become a rabbi, like his father, nevertheless to paraphrase him: mayors of the world, unite!. The blueprint for the future of your village can be found in Wilpoldsried. All you need to do is find a plan, consensus between the inhabitants and a financier. Meanwhile prices for solar have come down considerably, so there is no reason why it should take 14 years for your village to achieve 320% overproduction, let alone 100% coverage. If you can get the finance, do it, as it will pay for itself. Zoom in from space to see the solar panels on the roofs. Youtube text: A unique thermosolar power station in southern Spain can shrug off cloudy days: energy stored when the sun shines lets it produce electricity even during the night. The Gemasolar station, up and running since last May, stands out in the plains of Andalusia. Tower 140 m high, power 19.9 MW, uses molten salt as heat transfer and storage medium. 2650 heliostats, each 120 m2. 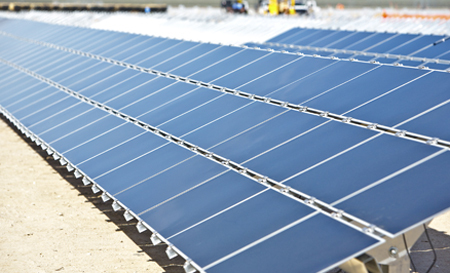 Gemasolar is the first commercial solar plant with central tower receiver and molten salt heat storage technology. Due to its storage system it allows to produce electricity for 15 hours without sunlight (at night or on cloudy days). Now that construction of the Southstream pipeline has started, what is the status of Nabucco? Nabucco is a planned pipeline between the Caspian and Austria and is preferred by the US, for geopolitical reasons, namely to decrease Europe’s dependence on Russia concerning carbon fuels. But there are so many problems that it is unclear if will ever come off the ground. To start with it does not make sense to build a pipeline if there is no gas to transport. The main candidate supplier would be Iraq with potential additional supplies from Azerbaijan, Turkmenistan and Egypt. But Iraq is not very stable. [forbes.com] – Even US magazine Forbes admits: “The Failure of Nabucco and the Future of Russian Energy.” (Feb 7, 2012). [spiegel.de] – And German weekly der Spiegel, a Washington subservient with little affinity for Russia admits: “Europe’s Failed Natural Gas Strategy”. Translation: US preferred Nabucco is going nowhere, where the Russians are building pipeline after pipeline. Shortly after completion of the second Northstream pipeline, Gazprom wants to build a third and fourth, directly connecting Russia with Germany, circumventing Poland, Belorussia and the Ukraine (May 18, 2012). [naturalgaseurope.com] – Reinhard Mitschek, CEO of Nabucco Gas Pipeline International: “Nabucco Will Be Profitable”. Despite the departure of RWE from Nabucco, Mitschek is confident that the Nabucco pipeline will be able to transmit up to 23 billion m3/year. The volume of gas production in Azerbaijan will increase to 20 bcm/a by 2015 and up to 40-50 bcm/a by 2025. Furthermore Mitschek does not doubt that the Shah Deniz consortium will decide on Nabucco in June 2013. (Dec 13, 2012). [naturalgaseurope.com] – Bulgaria Gives Nod to Nabucco’s EIA. The Bulgarian government has given the nod to the Nabucco consortium’s Environmental Impact Assessment for the portion of the pipeline in that country (Dec 21, 2012). 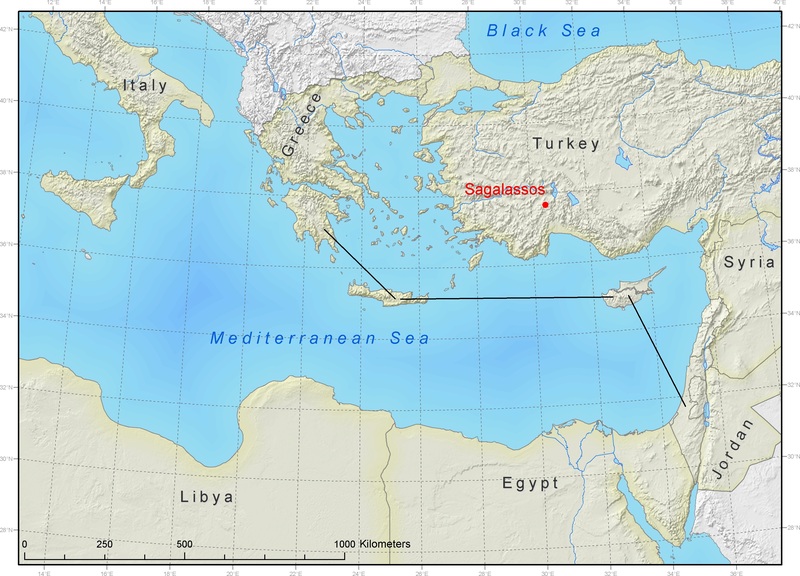 [nabucco-pipeline.com] – Meanwhile Nabucco itself seems to have given up the idea to build a pipeline from the Caspian to Europe and now proposes merely a pipeline from the Turkish-Bulgarian border into Europe (“Nabucco-West”). This pipeline should be connected to the Trans-Anatolian Pipeline (TANAP), a project that is still in the planning stages. In other words, even if Nabucco is completed it will transport only a small amount of natural gas into Europe compared to the potential of 238 bcm/a from Russia. In geopolitical terms Nabucco is a non-issue. [wikipedia.org] – Russia in the European energy sector. On December 7, 2012 Russian president Wladimir Putin attended a ceremony to mark the start of the building of the Southstream natural gas pipeline from Russia to Europe. Expected start of production in 2015. Destination countries: Bulgaria, Serbia, Hungary, Slovenia and Italy. [wikipedia.com] – Capacity 63 billion m3 per year, more than 20 times the amount of natural gas delivered by Russia to Bulgaria in 2011. [gazprom.com] – Gazprom and Bulgaria sign final investment decision on South Stream on November 15, 2012. The carbon fuel era began in Great-Britain and maybe that was the reason that until now the British were lagging behind with the introduction of renewable energy. But that could change soon as very ambitious projects are underway in the realm of offshore windfarming. Windfarm developers have acquired licenses in order to develop potentially up to 32 GW of wind power, about twice the power consumption of the Netherlands, eclipsing anything we have seen so far. 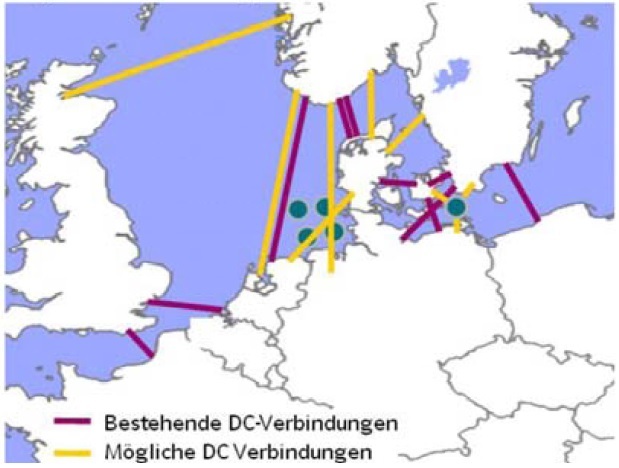 The largest area would be situated at the Doggerbank (13 GW), to be developed by Forewind. The UK has the biggest wind resource in Europe. The London Array wind project currently under construction already is the largest project to date (630 MW). The Doggerbank project will dwarf anything we have seen so far. 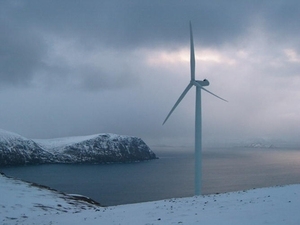 The Murmansk area in north-western Russia is known for high average windspeeds and thus suitable for windturbines. 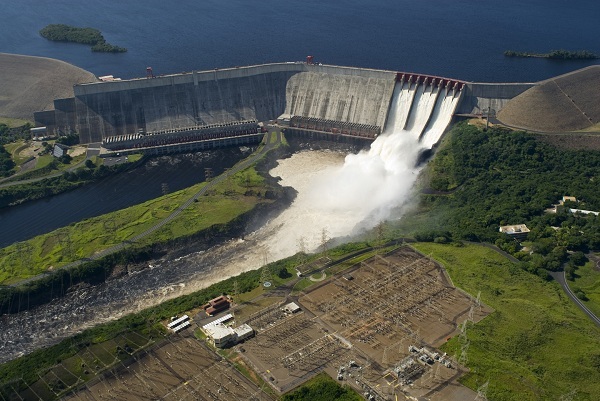 Potential for the region is estimated to be 2000 MW. The Dutch company Windlife is involved in a project. Statement by Dutch ministery of economic affairs dating from 2010 about the realization by Windlife and Ecofys to build six windparks of 600 turbines with a total capacity of 1.200 MW in 2015. Investment volume 1.2 billion euro. Last week the Moscow Times reported about the project that still seems to be alive and Windlife is still involved. The company expects to present a feasibility study by the end of this year. Maybe this article? 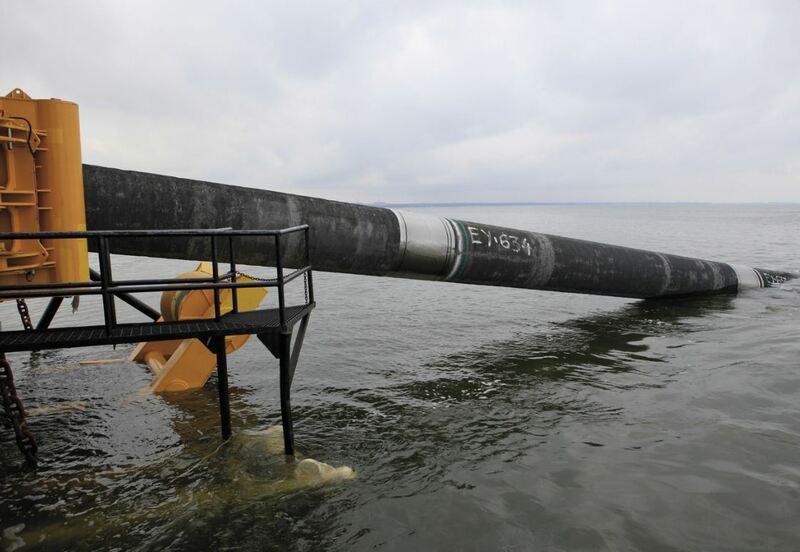 Oct. 8, 2012 | Portovaya Bay, Russia | Just 30 months after the start of construction of its first pipeline, Nord Stream’s twin pipeline system came on stream today, on schedule and on budget. There can be no doubt that this an event of major geopolitical significance. Europe is linking its fate to Russia, at least for the remainder duration of the fossil fuel era. The Atlantic became wider today. And this is only the beginning. Gazprom CEO Miller announced today that soon new decisions will be taken about additional pipelines, including to Britain. Operational 2015. First Solar will build it and Japanese Sumotomo Corp participates as investor for 25%. 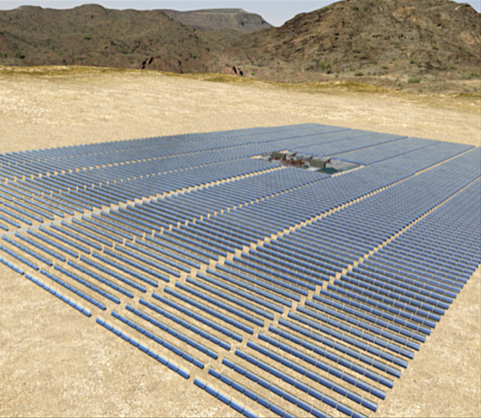 Location: Desert Light PV plant/Riverside County.